C. Willam Pollard "Without change there is no innovation, creativity, or incentive for improvement. Those who initiate change will have a better opportunity to manage the change that is inevitable." Lord John Maynard Keynes "When the facts change, I change my mind. What do you do, sir?" William E. Simon "Productivity and the growth of productivity must be the first economic consideration at all times, not the last. That is the source of technological innovation, jobs, and wealth." 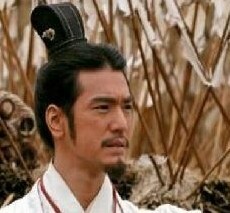 Zhuge Liang "An enlightened ruler does not worry about people not knowing him; he worries about not knowing people." George Santayana "Those who fail to learn from history are doomed to repeat it.". Deng Xiao Ping "It does not matter if a cat is black or white; as long as it catches mice, it is a good cat." Deng Xiao Ping was the supreme leader of China between about 1978 - 1992. He initiated and championed the Reform and opening up of China (改革开放) and an economic vision he called socialism with Chinese characteristics (中国特色社会主义), which has facilitated China's subsequent rapid growth in prosperity. "Appraisal: As the Chancellor of the State, Zhuge Liang pacified the commoners, elucidating proper behaviour and the moral standard. He simplified the administration and established timely, just policies; speaking frankly and sincerely. In dealing with the loyal and useful, he would reward them even if he felt enmity against them. In dealing with the criminal and heinous, he would dispense punishment if they were friends or relatives. In dealing with those who confessed and truly repented, he would be merciful even if their crimes were serious. In dealing with those who were glib-tongued and deceitful, he would be punitive even if their crimes were trivial. A benevolence no matter how minute would be rewarded. A malevolence no matter how slight would be castigated. In all affairs his administration was precise and penetrating, organising from the fundamentals, serving needs according to the true situation. He detested most the practise of deception. In the finality, all within the state esteemed him. Even though the legal system was severe, none despised him because his justice was fair and open. 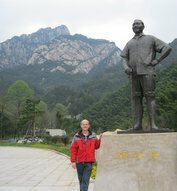 It can be said that he was exceptional in administration and the like of Guan Zhong and Xiao He." 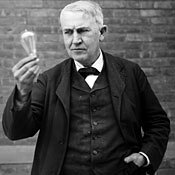 Thomas Edison was one of 24 inventors of the light bulb. He want on to roll out the electricity grid to homes and businesses, founding the predecessor to General Electric Corporation. He made the electricity infrastructure for his customers, so his light bulbs could be used widely. He invented, then he executed - achieving 'conversion' and 'diffusion' of his idea.